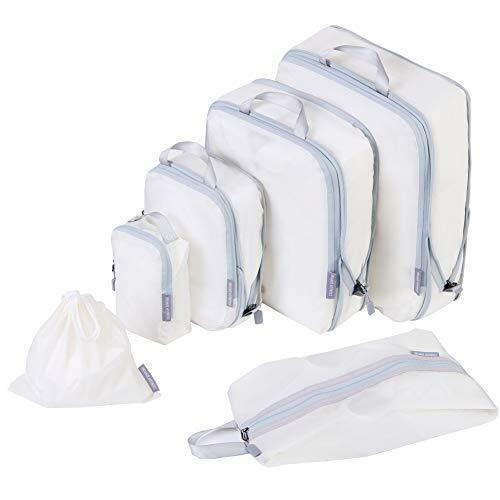 Packing cubes set includes: large (15.8*11.8*3.6 inches); medium (13.8*9.9*3.6 inches); small (9.9*6.7*3.6 inches); x-small (7.1*4.4*2.4 inches); shoe bag (14.6*7.5*2.4 inches); laundry bag (9.1*9.1 inches). Ideal for 24-25 inch suitcase. Compression and enlarge design. Open the outer zipper when need more packing room, and zip up to compress and save certain room. Make packing a breeze. The packing organizers are a game changer. No more rummage in the suitcase and make it a mess. Travel with elegance is no longer a dream. Large capacity but super-lightweight. Compared to those heavy travel cubes in the market, it's only half-weight of normal compression bags (about 0.55 lb), barely the weight of zippers. If you have any questions about this product by JJ POWER, contact us by completing and submitting the form below. If you are looking for a specif part number, please include it with your message.